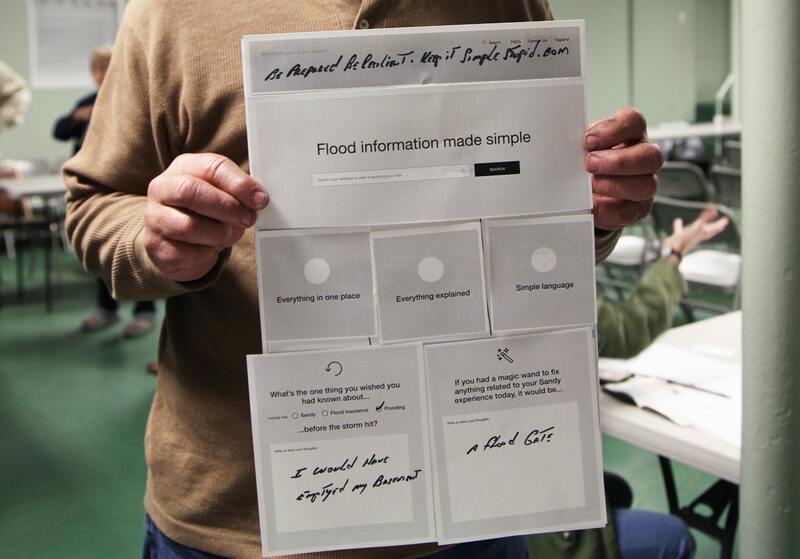 FloodhelpNY — helping New Yorkers become more resilient to flooding. IDEO worked with The Center for New York City Neighborhoods in addition to the New York Governor’s Office of Storm Recovery to create a platform for engaging and informing New York City homeowners about how they can protect their home and finances from flooding that is expected to worsen with rising sea levels caused by climate change. 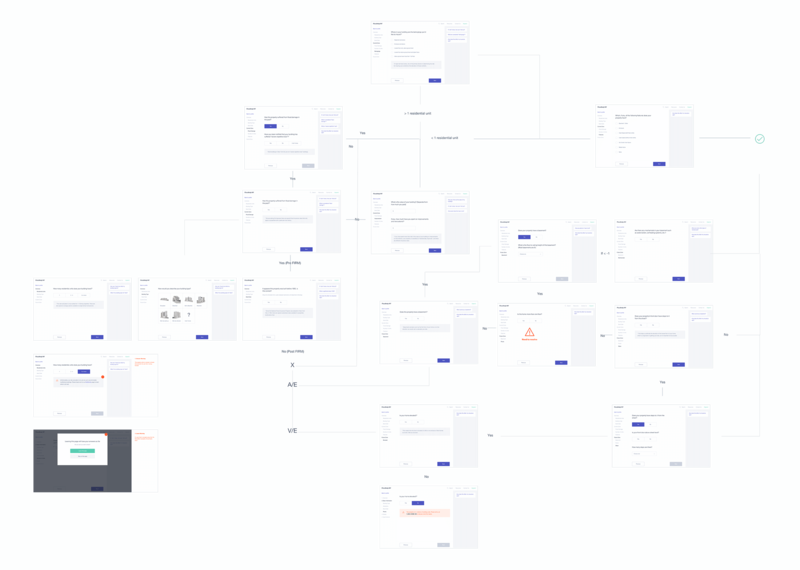 Along with conducting user research with the team, my responsibilities included information architecture, UX & product strategy, wireframing, front-end styleguide development, and front-end design. 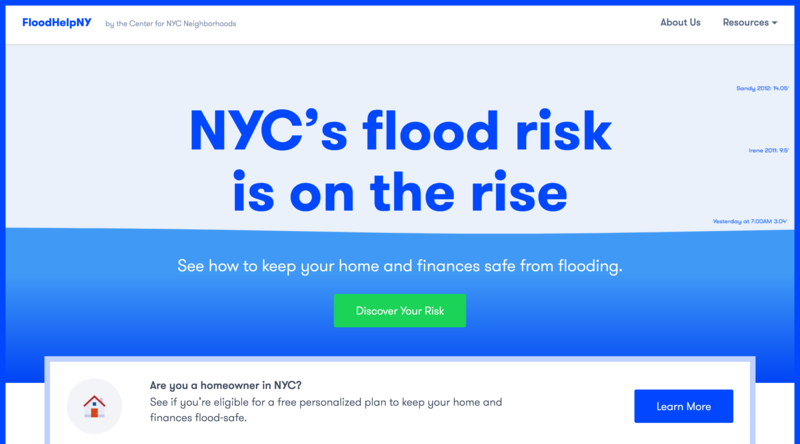 FloodhelpNY was the most loosely defined to-market sites I've worked on. No discredit to The Center — we were co-defining the next evolution of the platform together. Even though playing in our own back yard, this, paired with the tricky subject matter both technically and emotionally, made for a big challenge. We went to a flood insurance seminar in Gerritsen Beach. At the end, we managed to get 20 or so people to build their own "website". This one is called "keepitsimplestupid.com", a good piece of advice. In the sprint fashion, we tried to bring something testable to every user session. It was interesting hearing the reactions from people who lost their home versus the lucky ones who knew nothing about flood insurance. It was June 2016 — in the heat of chatbot mania. Myself and a teammate made a quick prototype to get in on the action. Do they work? Are they intuitive? The field research said no. Our participants wanted to see if they were at risk from flooding rather than have a fake conversation with our "Floodbot". Emojis weren't a hit either. The subject matter left little room for levity. The site was to serve a diverse audience of people who already felt the devestating effects of Sandy, people who were confused about the flood insurance program, and people who were unaware of the changing zones. Making sure people got the right messaging and relevant information to whichever situation they were in was crucial. One of the final "risk profile" iterations. This was a key page in the experience. Acting as the "reveal," it's what the user sees right after they enter their address. We focussed on striking a balance between preseting and explaining the information clearly, providing next steps, and not overwhelming the user. This ended up being too much — as one user said "make it quick, I'm on a website". The complexity behind calculating flood insurance, in addition to the baffling history and structure of the program itself, created a steep learning curve for the team. Previous attempts of creating a calculator are either tightly protected IP, laborous manual proccesses (involding long division), or failures. It ended up taking a village to tackle. This is the final flood insurance rate calculation flow. We converted it from a 23 step whiteboard sketch created live by a partner at NY legal services. Many New Yorkers who suffered damage from Hurricane Sandy had terrible experiences with the federal and state relief programs. There were complaints of incompetant staff, misinformation, huge periods of radio silence, etc. Our user research sessions tended to be highly emotional, often leaving us astonished at how much people continue to struggle 5+ years on. We made designing for trust a priority. Sketching out one of the steps of the RTAPP flow. While RTAPP isn't a government program, we saw it essential to make the expereince transparent and to set expectations at every step. 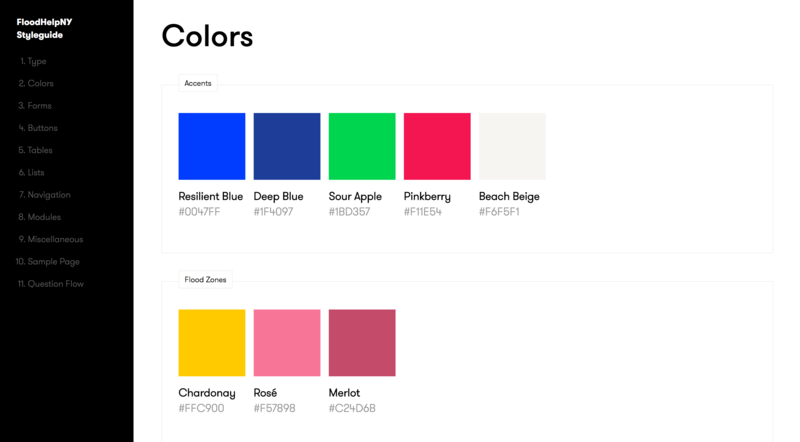 Near the tail end of the project, I decided to make a live styleguide. We were working with a development partner who wasn't staffed with deep front-end expertise, so it proved immediately useful. I made the components responsive in lieu of having designs for smaller screen sizes (we were going fast and definitely breaking things). You could take those colors for a seaside picnic. Have a look around at it here.